It’s one thing for a car to be great on a press launch. And it’s another thing to wow us over the six months or so of a magazine long-term test. But to stand up to the scrutiny of three hard-to-impress CAR readers – well, that’s something quite separate. 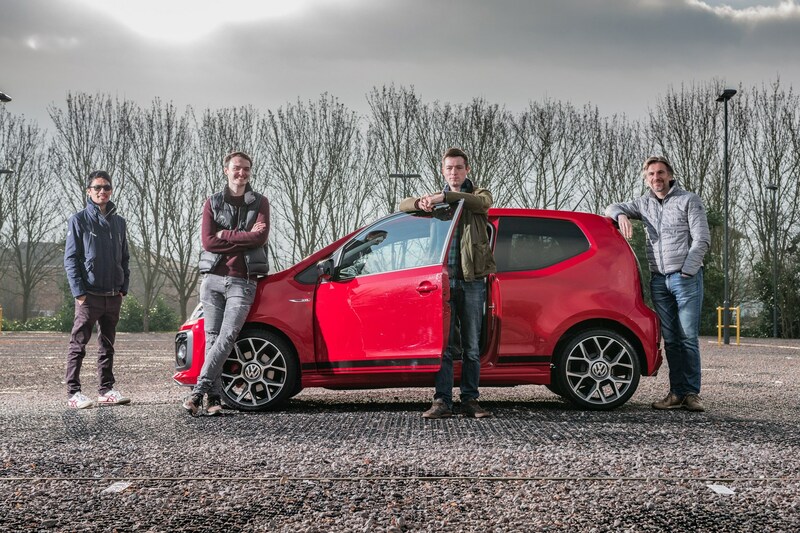 But that’s the treatment we’re giving to the VW Up GTI, subject of this first in a new series where our test cars get examined by three different members of the great British car-buying public, each with his or her own perspective and agenda. The Up GTI certainly did hit the spot on that launch. It involved a combination of heavy traffic in Monaco and Nice, and some rally-spec roads nearby. It could have backfired horribly for a lesser car, but VW’s confidence was vindicated. 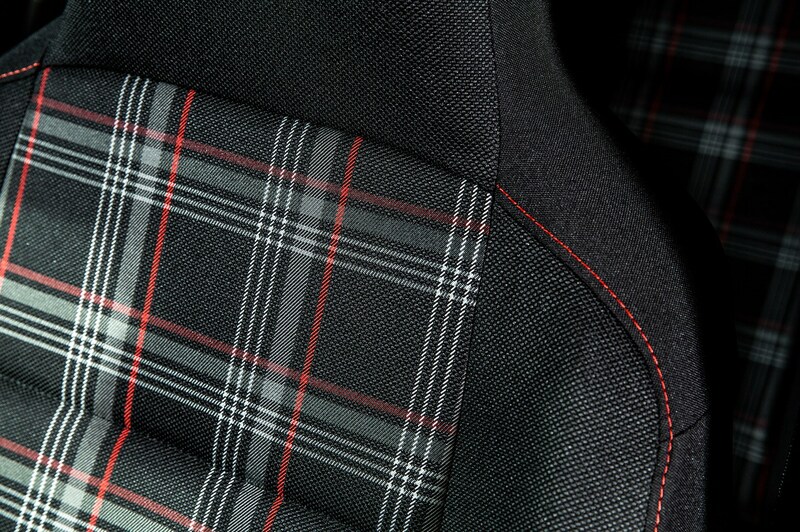 This little three-pot cube of torque and tartan was brimming with pure driving pleasure, but could also cope just fine with congestion. And more recently, running an Up GTI as a long-term test car has provided twice-daily pleasure, and excelled on some longer journeys too. We know it’s not perfect, but it’s universally liked in the CAR office. 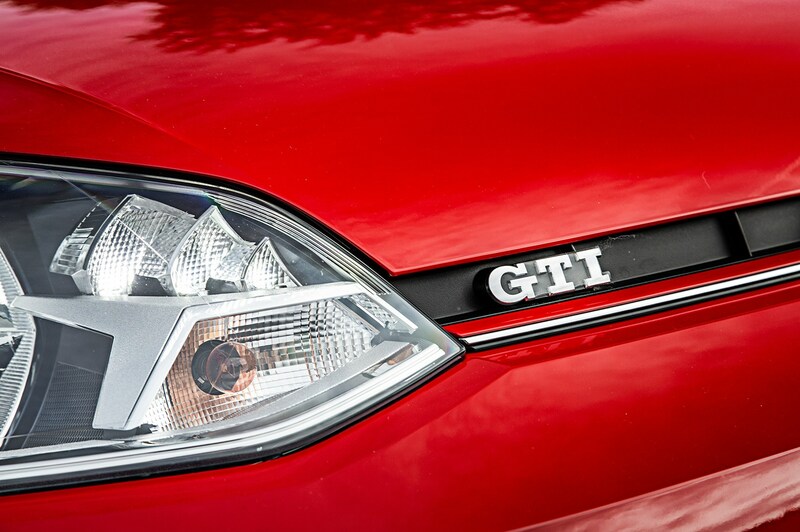 Now, however, it’s time for the GTI to meet folk from outside the inner circle of the CAR team. 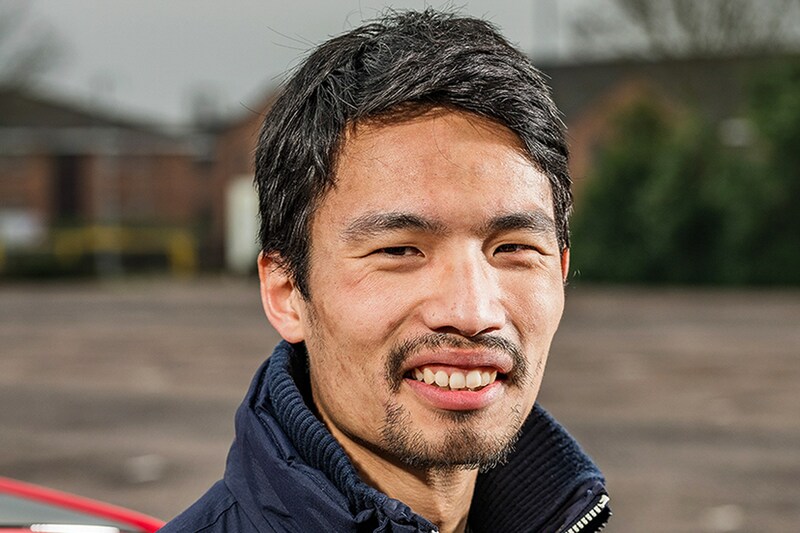 They are Lawrence Cheung, hot hatch owner and Japanese car fan; youthful classic-car enthusiast Aaron McKay; and walking VW Group encyclopaedia, dealer and modifier Andrew Chapple, the Volkswizard himself. Three interested parties with three differing outlooks. As the keeper of two heroic hot hatches (a current Ford Fiesta ST and Honda Civic Type R EP3), Lawrence sets the bar very high. Does the Up even register on his radar? 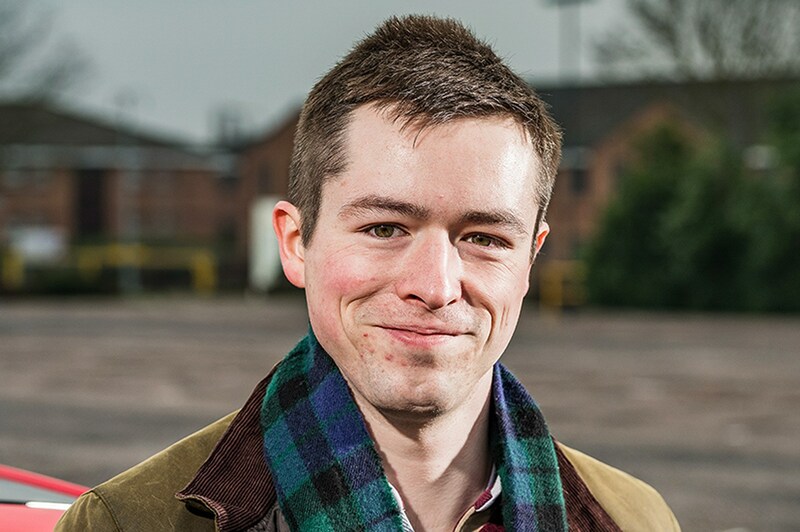 A self-described ‘old car guy’ despite his youth, Aaron owns a Mk1 Ford Focus. Can spot a phoney at 1000 paces. Will the Up pass muster? 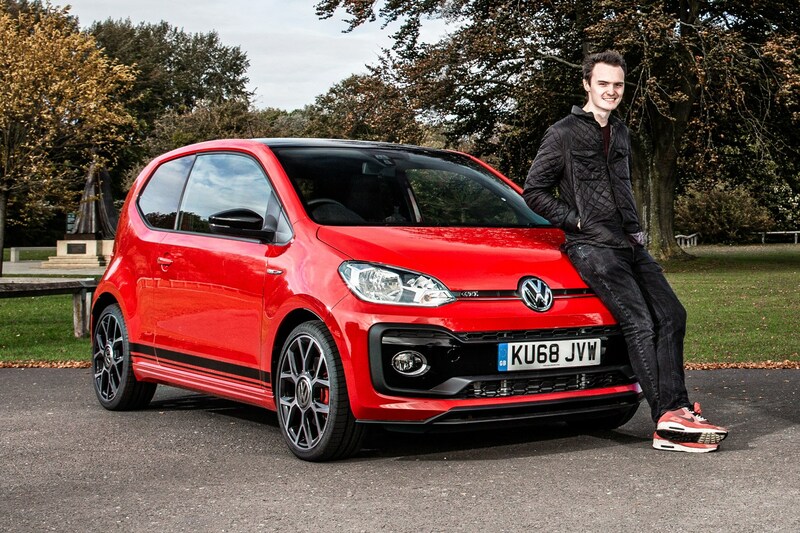 Andrew Chapple, of VW sales-specialist Volkswizard, knows his hot VWs inside out and owns an Up GTI – but, intriguingly, is selling his. What gives? There’s general agreement that the Up is pretty well proportioned: a wheel in each corner, boxy but not too tall. And it has the right sporty details. ‘This is definitely the best colour for it,’ says Cheung. ‘Plus, I’d never seen one in three-door form until now. 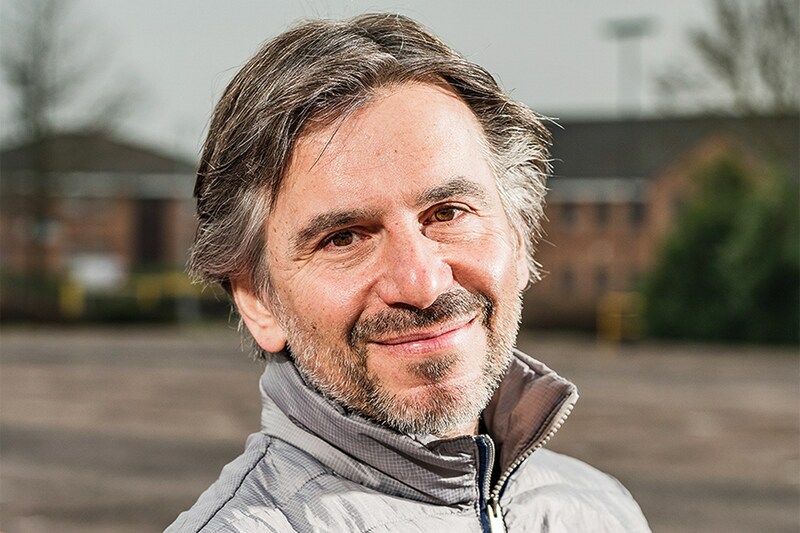 It looks so much better than the five-door silver one I tried once – that rear window line makes a big difference.’ They’re all pleasantly surprised that there’s something resembling room in the back: better than the Up’s ancestor, the Lupo, Cheung observes. But the cabin could be better, even within the restrictions imposed by its size. McKay can’t abide the fat plastic dash cover: ‘That panel on the dashboard is probably the worst bit about the interior. It’s the opposite of what I like about the door panels, where VW quite rightly decided that not everything needed covering with trim.’ And the instruments make curious use of space, with a ludicrously large fuel gauge that could easily be cut in half to make way for a coolant gauge that would tick a retro hot-hatch box. That’s exactly what’s sitting on the standard 17-inch ‘Oswald’ wheels of our car. Those wheels are a key feature of the package that turns an Up into an Up GTI, along with sports springs, bigger front brakes with red calipers, heated seats and black exterior detailing. Our car has £1175 of extras, including the combination of black roof and Tornado Red paint, the City Emergency Braking pack, automatic lights and wipers, Beats audio and the Cruise and Park pack. So there are more negatives and more room for improvement than I’d figured out for myself. But our trio all really like the Up GTI and can’t suggest any showroom-fresh alternatives that provide similar performance and fun for the money. The Up went on a little competitive getaway with our Suzuki Swift Sport deep within Thetford Forest to see which is the more fun car. You can check out that full report here. 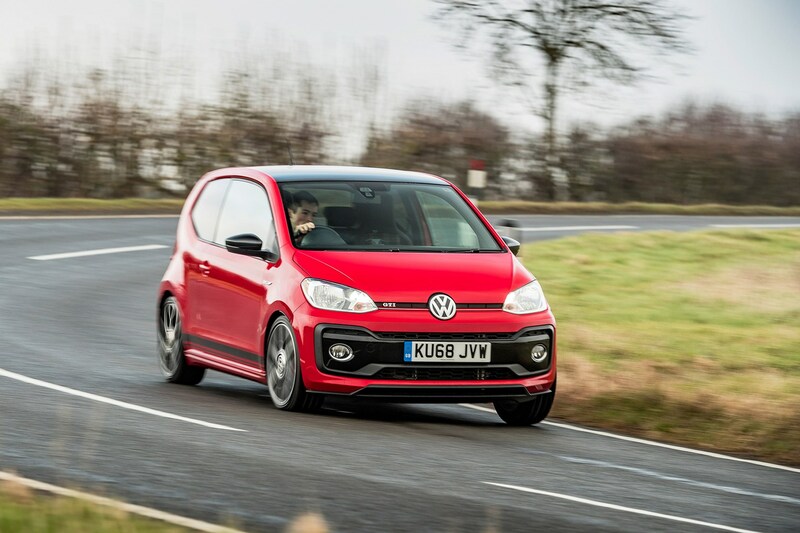 Month 1 living with a Volkswagen Up GTI: hello! I’ve been looking forward to getting into this – can you tell? That big grin on my face should be enough of a giveaway. 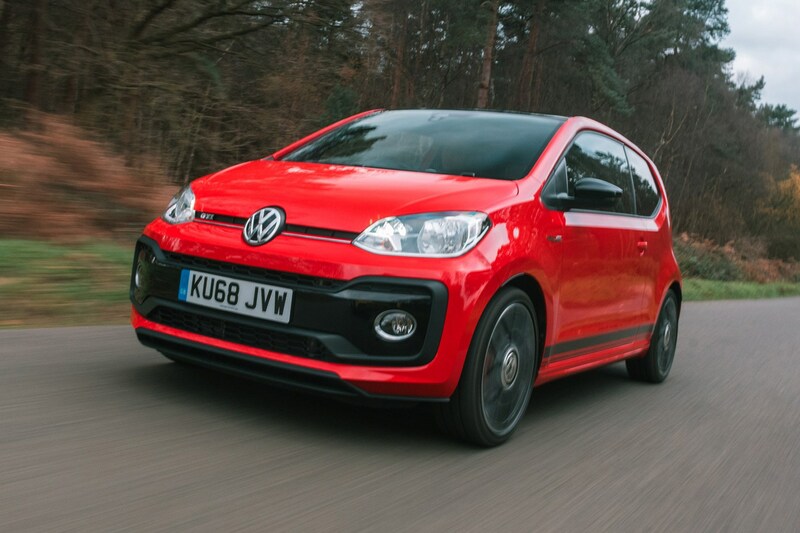 As our long-term Nissan Leaf leaves my care and enters the dapper embrace of Ben Whitworth, I’m buzzing at the prospect of six months with the VW Up GTI. I drove it on the press launch last winter and have been figuring out ways to get one into my life ever since. The stars aligned and here we are with an Up GTI, built exactly to my specification. I rarely use the back seats of any car, so going for the three-door was a given. An all-black look was considered, so the red detailing would stand out, but I’d be hated from here to Hanoi by our photographers, because black rarely works well on the printed page, and in any case the Tornado Red with black roof combo (£125) looks equally tasty. The City Emergency Braking pack (£380) comes with automatic lights and wipers, and I ticked the Cruise and Park pack (£300) box mainly for the cruise control – useful for my regular trips to Tyneside – rather than the parking sensors, which really aren’t necessary on a car this small and with such good visibility. I couldn’t resist the excellent Beats audio system (£370), which is a nice fit for my habit of blasting bassy house at deafening levels almost all the time when driving. Those extras are on top of a very well sorted basic package. The Up GTI comes with a series of improvements over any other Up: sports springs, bigger front brakes with red calipers, tasty 17-inch alloy wheels and heated seats. At the front, the grille looks meaner. At the side, the rear windows are tinted. At the back, there’s a black diffuser and chromed tailpipe. Oh, and there’s that peach of an engine: 999cc, three cylinders, one turbocharger, 113bhp and an excellent power-to-weight ratio. How is the day-to-day reality matching up to those sky-high expectations? Put it this way: I regularly take the Up home instead of far more powerful/expensive/luxurious metal that’s available in the office car park. On the few occasions when I’ve been separated from it, I find I really miss the GTI. When I’m in the office I keep coming up with all sorts of flimsy excuses for taking it out at lunchtime. Whatever the journey, every slip road and every roundabout becomes an opportunity to squeeze the most out of a sweet fruit. So yeah, it’s going well. Not everything is rosy. The lack of steering wheel reach adjustment is irksome. The seats are crying out for thicker bolsters. And on some roads the ride feels too firm. And you can’t turn off the traction control. Still, I’ve got a plan for the next few months: keep a tight grip of the GTI steering wheel, revel in the gargly triple’s mid-range pull, and don’t come back until the brakes smell.